Over the centuries villagers, visitors and pilgrims have come to Dorchester Abbey for worship, inspiration and contemplation. 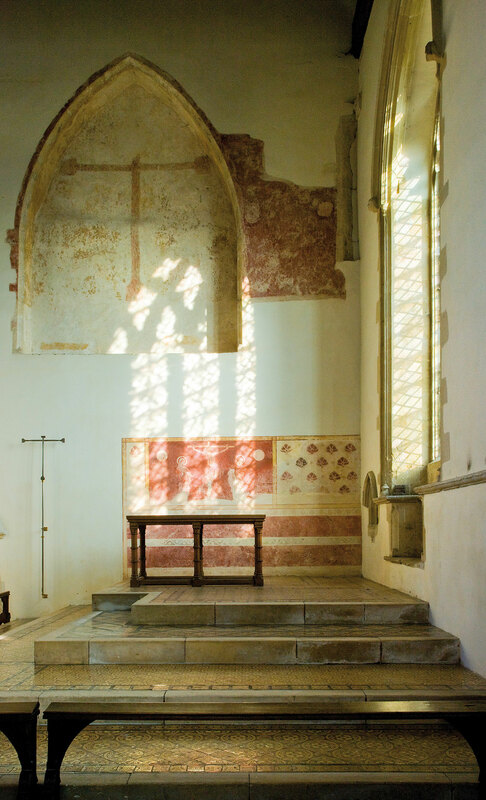 In medieval times, when there were no books, wall paintings acted as a permanent ‘teaching aid’ in churches, depicting stories from the Bible or items of particular relevance to the building: for example, that of St Christopher in pilgrim churches. Today, there are two places in the Abbey where 14th century paintings can still be seen – a Crucifixion scene in the People’s Chapel and a huge St Christopher and Christ child in the south choir aisle. There are also some bright wall paintings in the Lady Chapel which were executed 500 years later. Designed by Clayton & Bell in 1893-94, they were intended to beautify the Abbey, a follow-up to the extensive restoration works of William Butterfield and Sir George Gilbert Scott earlier that century. 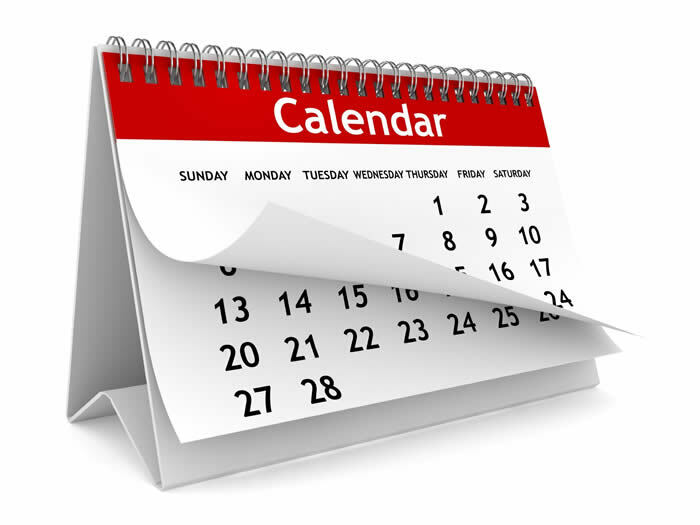 The theme is the Annunciation (the announcement) by the Archangel Gabriel of the impending birth of Jesus the Son of God to the Virgin Mary. 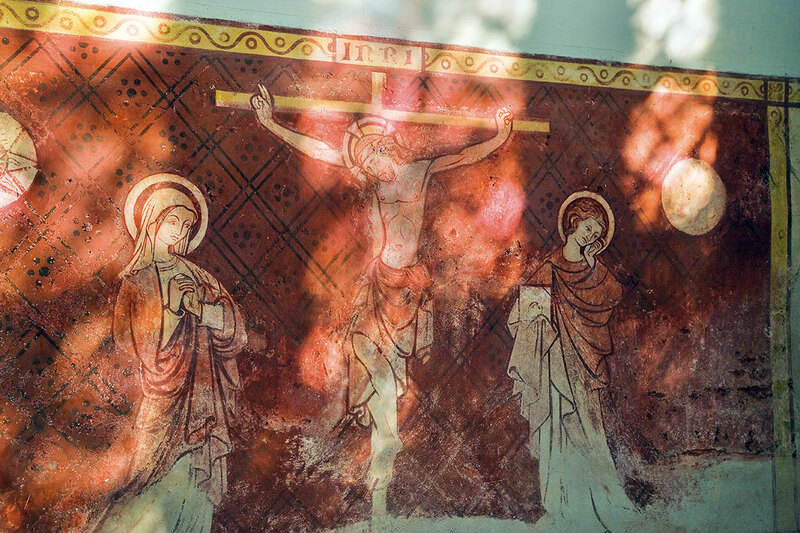 On the east wall of the People’s Chapel is the 14th century Crucifixion, the best known of the Abbey’s wall paintings. This shows Jesus on the cross, with the Virgin Mary standing on the left and St John on the right, with the sun and moon above. It would have formed a reredos (the background to an altar). Recent restoration work has shown that two-thirds of this ’14th century painting’ are on a rather coarse 19th century plaster, presumably the work of the restorers Clayton & Bell in the 1860s. Fortunately, the figures are mostly on the original plaster, while the leaf pattern decoration to the right is early 15th century. The east wall of the People’s Chapel is dominated by an arched recess which is not a blocked–up window but rather the frame for another Crucifixion scene. This comprises two phases of decoration. All that remains of the first phase is the outline of a pair of bare feet (St John’s) and a red vine pattern at the base of the inner faces of the recess. Formerly there would have been a carved wooden figure of Christ in the centre with painted figures of the Virgin Mary and St John on either side. The second phase comprises a red cross set against a pale yellow background with remnants of floral and scroll decoration. The inner face of the recess has a distinct chevron pattern. During the redecoration of the Abbey in 2003/4 patches of colour were noticed on the south wall of the Shrine Chapel. One of these, to the left of the westernmost window, above the horizontal stone rail (the string course), was uncovered in 2006 to reveal a huge, but rather indistinct, painting of St Christopher,14 foot tall. Christopher means ‘Christ – bearer’. The legend tells of a child who asks to be carried across a river; as the journey progresses he becomes increasingly heavy. The child then reveals himself as Christ and tells Christopher that he has carried the weight of the world on his shoulders. Christopher is the patron saint of travellers who believed that if they saw his image they would not die that day. His image would have been one of the first things pilgrims would have seen when approaching the Birinus shrine. The clearest part of the painting is the Christ child seated on St Christopher’s left shoulder, holding an orb in his left hand and giving the blessing with his right. The outline of St Christopher’s head is clear as is his dark beard. Evidence was found of at least three phases of painting; you can just make out a second, larger orb behind the present one. The paintings in the Lady Chapel were commissioned by the Vicar, Reverend Nathaniel Poyntz, in 1893. 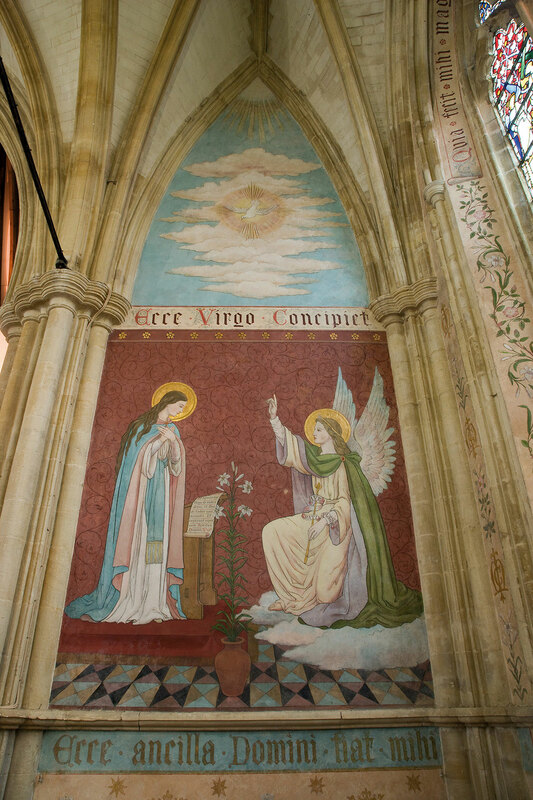 The first stage was the decoration of the walls below the string course, and the second the painting of the Annunciation on the north wall and the designs on the surround of the east window. The first stage design was the Virgin Mary’s monogram (MR – Maria Regina – Queen of Heaven) surrounded by lilies and dog roses symbolising purity and the Mystic Rose. Just beneath the string course is an extract from the Magnificat in gold letters, in Latin, ‘Ecce ancilla Domini fiat mihi secundum Verbum tuum’ (Behold the handmaid of the Lord, be it unto me according to thy word). In the Annunciation scene the Virgin Mary stands in front of a prayer desk, while the Archangel Gabriel kneels before her, holding a staff and scroll in his left hand and pointing with his right to the dove (signifying the Holy Ghost) above. One of the most intriguing details is that the painting is signed ‘W.T.BEANE 1894’ in almost invisible letters near the hem of the Archangel’s cloak. The rose and lily motifs are continued on the surround of the east window, with ‘Qui fecit mihi magna qui Potens est et Sanctum Nomen ejus’ (For He that is mighty hath magnified me, and Holy is His Name) at the apex. In the south arch of the Norman crossing, on the east side above a plinth, are traces of colour indicating the existence of a side altar with a reredos. It seems that the original painting was lost during the reformation and was replaced by a Virgin and child during the reign of Mary Tudor. This in turn was defaced in Cromwellian times as is shown by the deep gouge marks made with long-handled pikes. 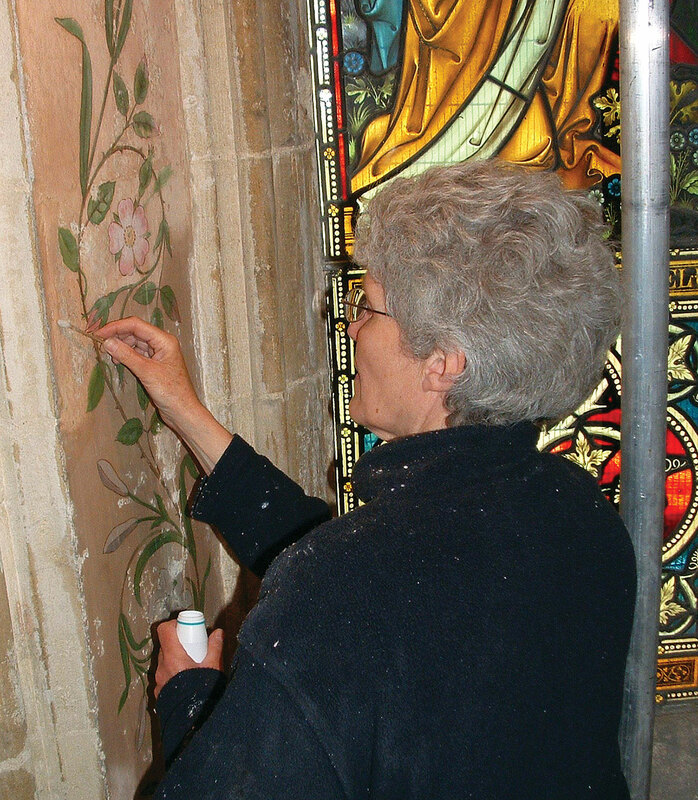 The restoration of the wall paintings was carried out during 2005-06 by Ann Ballantyne FIIC ACR and her team of co-workers. This difficult work required great skill and infinite patience, taking altogether some 2000 hours. Each painting entailed a different approach, depending on the type and cause of the damage and whether or not touching-up of the colour was required. Under-plaster was consolidated with slaked lime and, if delaminating, the voids were filled with grouts of lime and fine sharp sand. Overlying limewash was removed with scalpels and brushes; a square inch could take an hour or more. The Annunciation was in particularly bad condition, having been damaged by rainwater over a period of years. Surface salts were removed with brushes and consolidation was achieved with Plextol 500 applied through tissue, followed by gentle pressure. After consolidation, the overlying layer of varnish was removed with acetone and the black sulphation layer underneath was cleaned with ammonium bicarbonate. When all was dry, the repairs were given a thin layer of gum arabic and the colours retouched using water colour paints in gum arabic. Re-touched paintwork was distinguished from the original by applying it in fine parallel lines, a technique used to good effect in the Crucifixion scene. The project was made possible by grants from the Heritage Lottery Fund and the Dorchester Abbey Friends.